While education reformers and policy makers grapple with big fixes and the politics of national initiatives, most teachers and parents share the simple and urgent desire for students--especially those from low-income communities--to be on the road to college and ultimately to develop into people who will be equipped to thrive in the unpredictable future ahead of them. Nevertheless, the great majority of American schools do not respond to this urgent need. And just what this sort of education looks like, day to day, remains elusive. In Deeper Learning, education strategist Monica R. Martinez and sociologist Dennis McGrath take us inside eight schools that have set out to transform the experience of learning. In these schools, we meet teachers and students who show us just what "Deeper Learning" looks like. The examples from these pages--from high school kids developing energy-saving solutions alongside engineers to young people discovering the complexities of sustainability on an oral history expedition to Appalachia--offer an inspiring and expanded vision of what's possible in schools today. An accessibly written showcase of schools and practices designed to empower educators and students alike, here is a book for all who are concerned with the dual need for American schools to be genuinely innovative and to embrace what works. 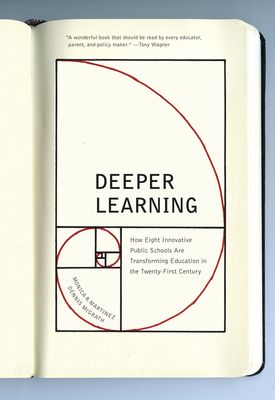 Deeper Learning demonstrates how students in their teen years can become passionate learners and global citizens ready to take on a world increasingly defined by new technologies, economic shifts, and profound social challenges. Monica R. Martinez is the chief school support officer for the XQ Institute. Former president of the New Tech Network and former vice president of KnowledgeWorks, she was appointed by President Obama to serve on the President's Advisory Commission on Educational Excellence for Hispanics. She lives in the Bay Area. Dennis McGrath, PhD, is a professor of sociology at the Community College of Philadelphia where he won the Christian R. and Mary F. Lindback Distinguished Teaching Award. He is the author of The Collaborative Advantage: Lessons from K-16 Educational Reform, among other works. He lives in Philadelphia.